We originally ran a post for the Without Mercy Release Day Blitz and Giveaway when the giveaway began on Friday, but since our review was scheduled to run today we have decided to rerun the blitz info. Anyone who commented on Friday's post will be entered along with anyone who comments below into the contest. We welcome everyone to our blog today. 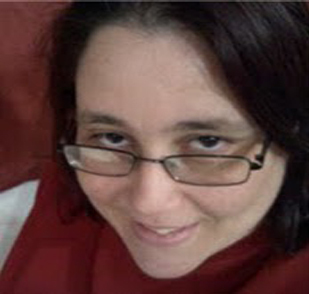 You may have noticed we sponsor a lot of Bookish Snob Promotions tours and now The Bookish Snob herself, a prolific blogger, book promoter, and lovely person, joins the ranks of published author. Congratulations, Bels! 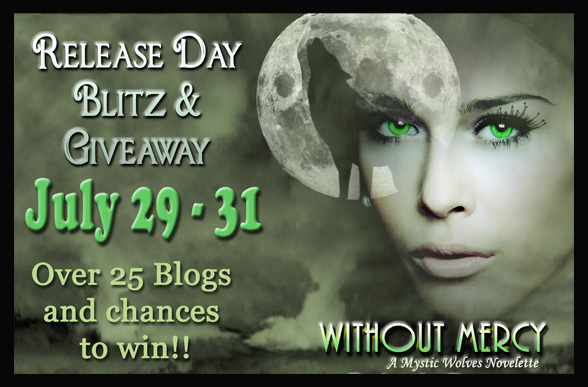 Over 25 blogs are hosting this weekend tour and each is giving away TWO copies of Without Mercy. Blurb: What would you do if a simple errand takes a deadly twist, turning you from cautious prey to dangerous predator? Author bio: A homesick Aussie living amongst the cactus and mountains of Arizona, Belinda Boring is a self proclaimed addict of romance and all things swoon worthy. When she's not devouring her latest read, you can find her celebrating her passion for books on her blog The Bookish Snob. With all that excitement, it wasn’t long before she began writing, pouring her imagination and creativity into the stories she dreams. Whether urban fantasy, paranormal romance or romance in general, Belinda strives to share great plots with heart and characters that you can’t help but connect with. Of course, she wouldn’t be Belinda without adding heroes she hopes will curl your toes. Surrounded by a supportive cast of family, friends and the man she gives her heart and soul to, Belinda is living the good life. Happy reading! 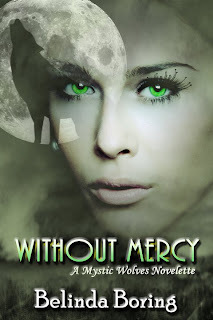 To win one of two copies of Without Mercy, leave a comment below and don't forget to check out the other blogs. Good luck! The one time werewolf Darcy decides to wander away from Pack territory to go to the store with her Alpha mate's sister, Jasmine, without the watchful eye of any members, it just happens to be the day danger comes calling. With her heightened sense of smell this wolf already knows her stalker is lurking in the shadows behind her, waiting, and he's dangerous. With his weapon drawn, what Darcy hadn't figured on was his familiar smell. She knew him but all she wonders is why. Why does he want to kill her and what can she do to stop him? And so begins the opening scene of Belinda Boring's debut novella, Without Mercy, Book One of Mystic Wolves. This novel may be short in pages but it certainly doesn't skimp on anything else. This urban fantasy yarn spins an enticing web, grabbing the reader from the first tense moment. Darcy gives us an insightful view of a young werewolf still learning when and how to loosen the feral beast inside of her. I enjoyed how her other fur-covered half would interject observations or feelings as the human Darcy's fights to keep the confrontation violence-free. As she watches over her younger, inexperienced friend, we see her inner battle for control and to do what is right, until she has to no choice but to finally give in to the beast inside of her. 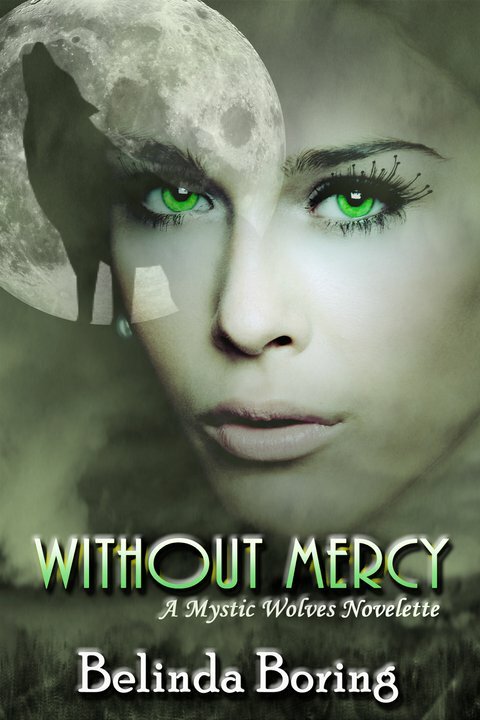 Aside from a few typos, Without Mercy was a gripping and emotional story. Tension-filled from beginning to end, we are privy to one she wolf's interactions with a crazed human and the fight she undertakes to keep her humanity intact. Though her scene with her mate, Mason, was short, the strength of their bond was obvious, as was his love for her. I used to believe werewolves were not my favorite kind of supernatural creature, but quite a few adult and YA authors have proven me wrong with their stories. I must now add Belinda Boring to my list of writers convincing me to keep on reading their engrossing wolf tales. Move over vampires, angels and fey, make room for the wolves. Favorite excerpt: "I reached inside and called on the change, but my wolf refused to relinquish control. I pushed and she pushed harder. I begged and coerced She ignored it all. I panicked. It had been a long time since the wolf had been this strong and there was no budging her. She was adament that if she had been in control to begin with, this could've been avoided. We stay a wolf and everyone will be safe." Cover comment: I like the howling wolf silhouetted inside the moon and the image of Darcy to the right with her green eyes. Even though magic was briefly mentioned, I wonder about the prominence of her eyes and if they will play a role in any future titles of this series. Book source: Received from author for book tour for my honest review. I have to agree with the others, the premise sounds just as great as the cover looks! Thanks for the chance! This sounds awesome, the cover is so pretty! Your review and the excerpt convinced me. I'm adding it to my B&N cart now in case I don't win it! Thank you so much for your awesome review Laurie and for having me on your blog! This has been such a fun weekend and I'm so grateful for everyones support. Thank you to everyone who entered. I have to say, I'm with you on the cover. I had full body tingles when I saw it completed and have been lucky with getting such an amazing cover artist. Good luck! This story sounds amazing! And I'm lovin the cover!